First off, I have to correct a grievous error on the previous post. According to Sylvia’s Aunt in Ireland I made a horrible mistake not including this picture in the post. So Finola, this one’s for you! 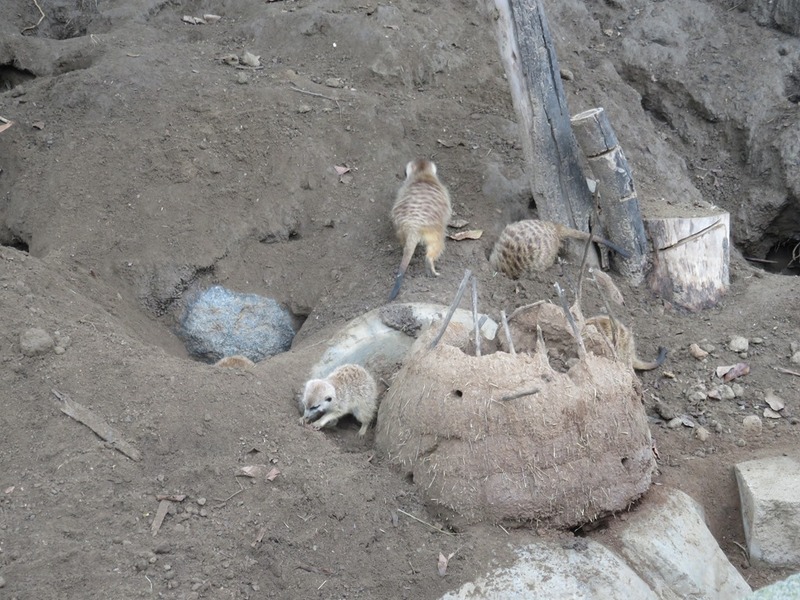 Who doesn’t love Meerkats after all? 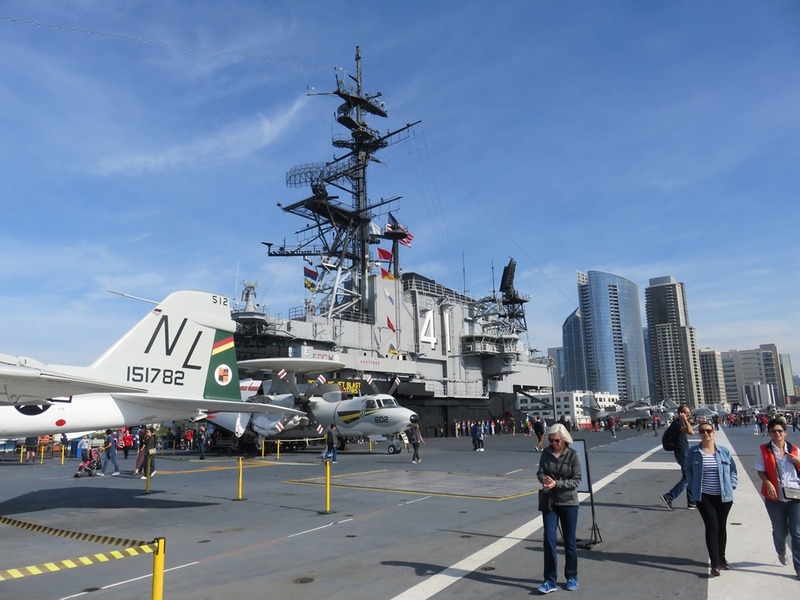 Our next day in San Diego was spent exploring the USS Midway, a retired Aircraft Carrier first commissioned in 1945 right after the Second World War ended. 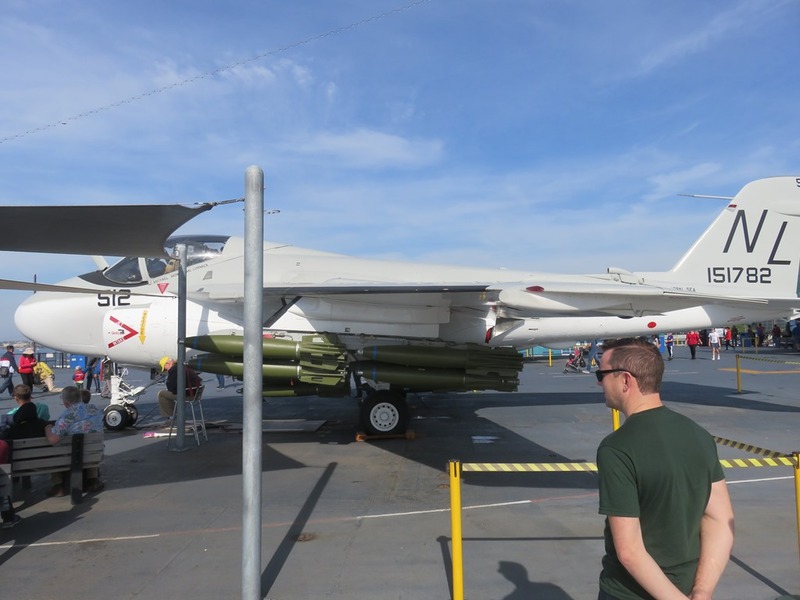 It stayed on active duty until 1993 and was the US Flagship during the Desert Storm kerfuffle in 1991. 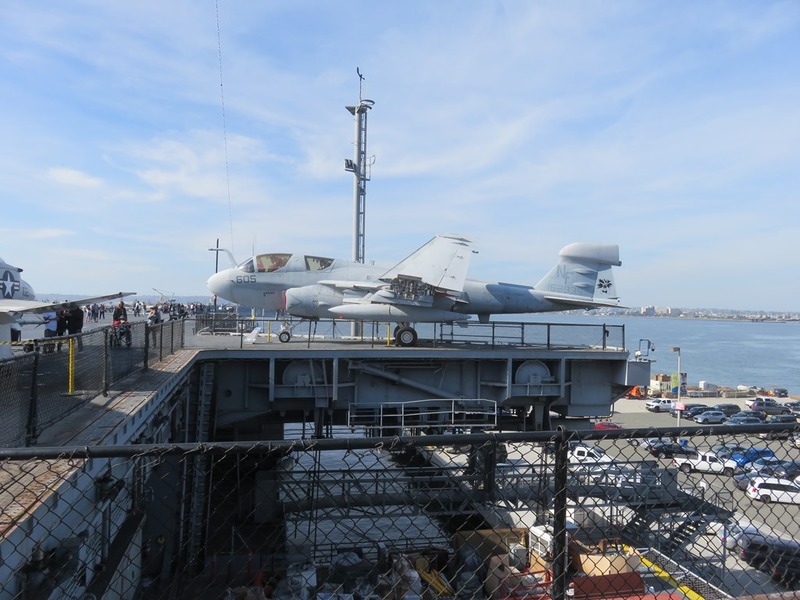 It really is quite impressive to see how large these ships are, as the Flight Deck is 4 acres in size. 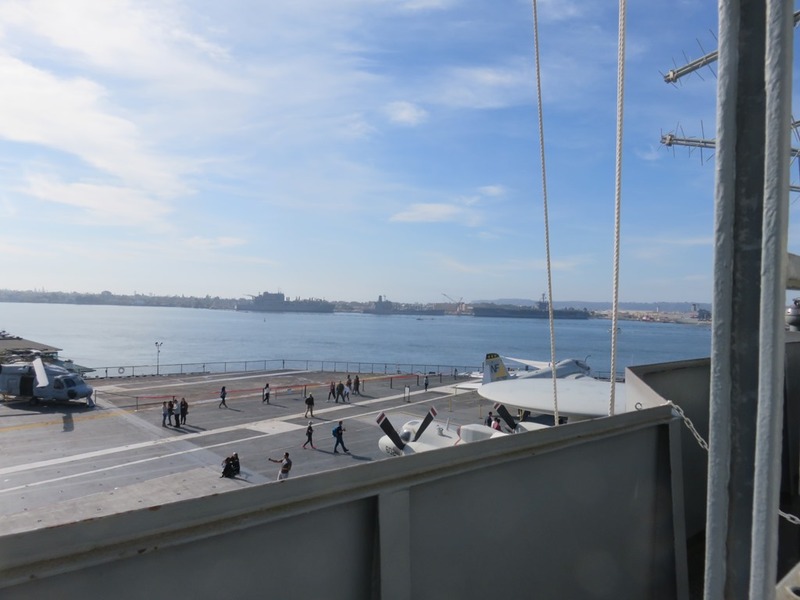 By comparison, the newly commissioned USS Gerald Ford has 6.4 acres of deck space, bigger than many Hobby Farms. Mind you I still wouldn’t like to land a plane or jet on it when it is moving 30 MPH and pitching up and down 30 feet or so in the middle of the ocean. 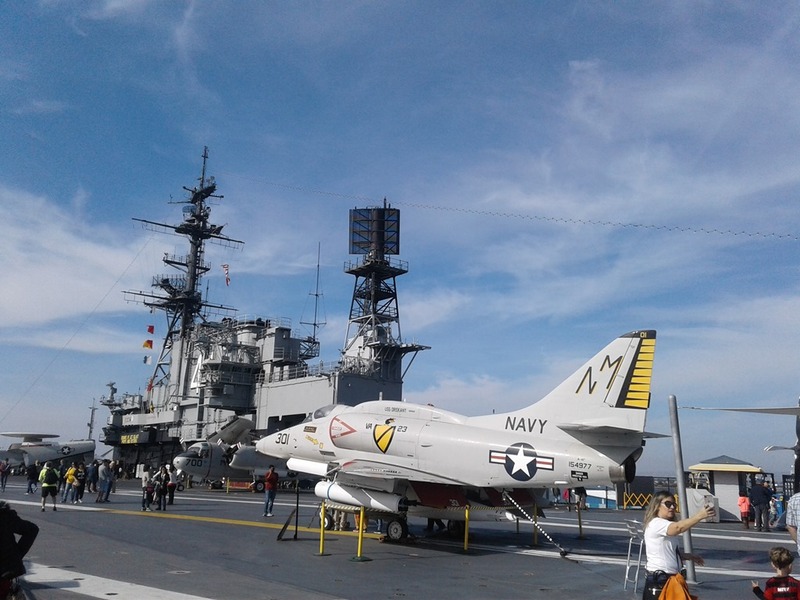 This exhibit was definitely one of the things our Son wanted to do, as he’s been a sucker for airplanes since he was a little kid, and seeing the Corsair and Intruder on the ship made his day. He has a Remote Control Corsair with a 5 foot wingspan squirreled away in storage somewhere, and has wanted to fly an Intruder since I gave him the Vietnam War book, Flight of the Intruder, when he was a teenager. It was a nice day in San Diego! 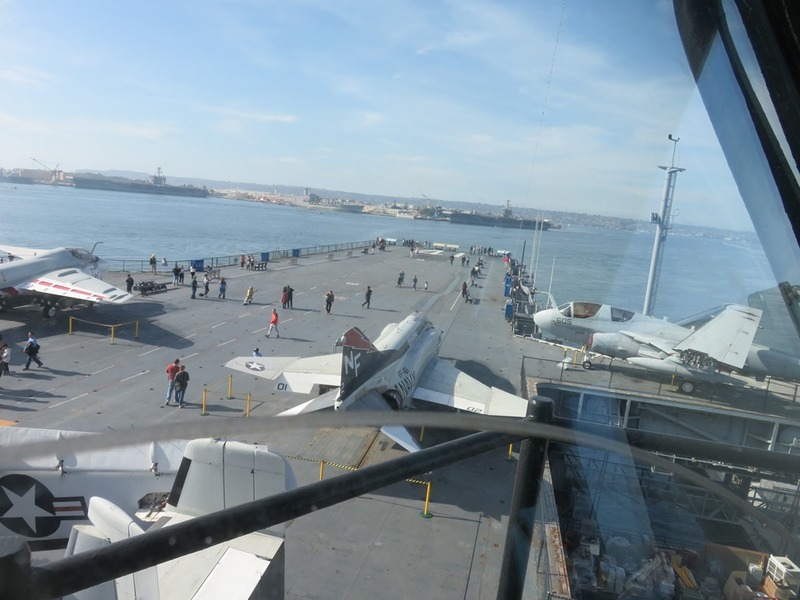 The vessels in the distance are newer and larger Aircraft Carriers undergoing refit. Gotta love the Intruder. I believe they can carry thirty-two 500 pound bombs at a time. 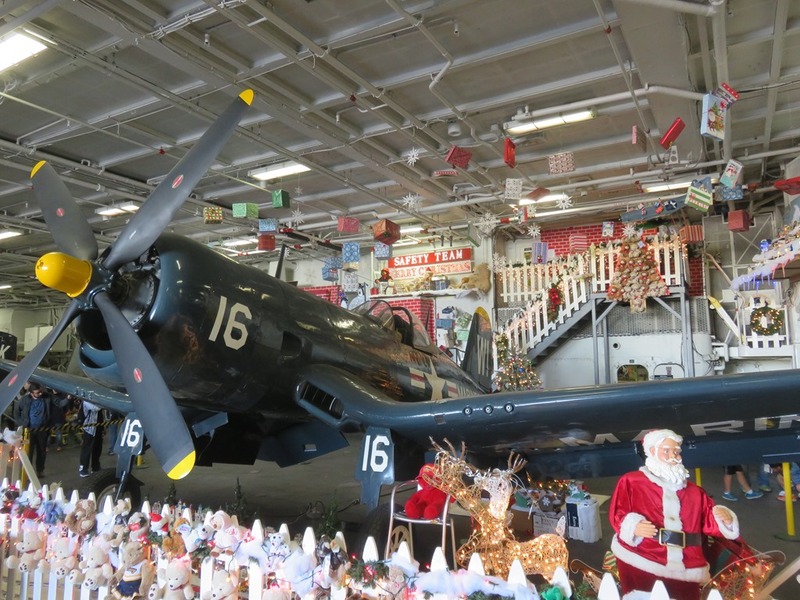 And then there was the Corsair on the Hanger Deck. The immense size and surprisingly cramped living spaces and stairwells were interesting to see. I only banged my head once….right after I was told to watch my head going down the stairs. Normally I’m not tall enough to hit my head on anything, so I can’t imagine they tried very hard to recruit 6 foot tall sailors. 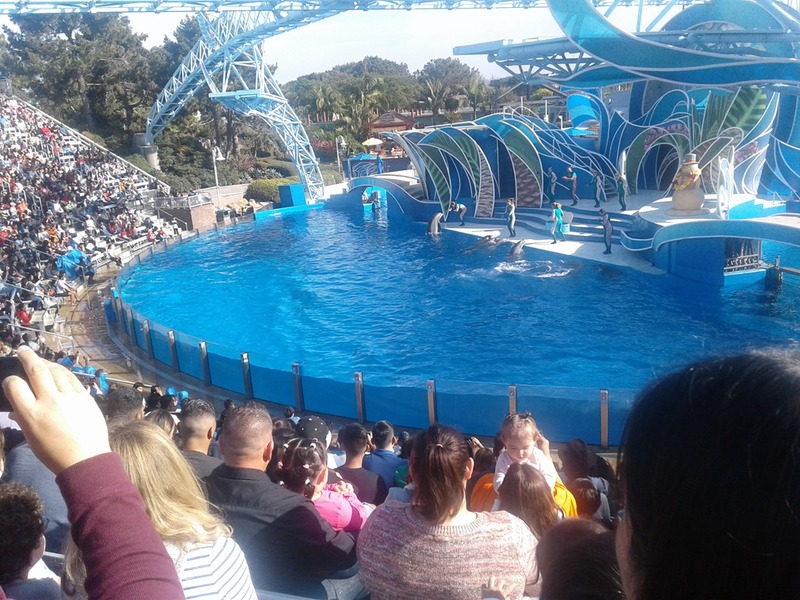 Our last full day in SD was spent at Seaworld. This was another site that we’d been to in the distant past, and it has many features that were familiar, and several new ones. 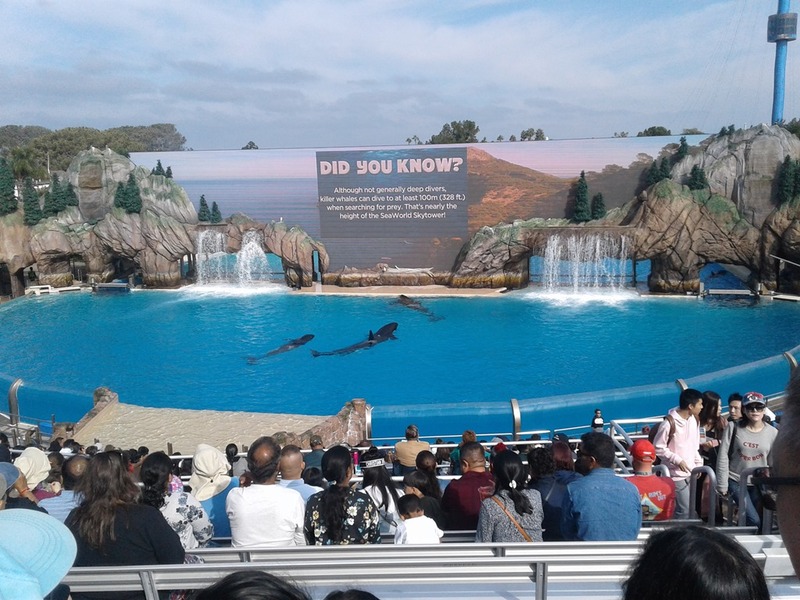 The massive video screen at the rear of the Orca pool was one of the improvements. It kept up a running dialogue to inform and educate the audience. The Dolphin enclosure seems to be larger than I remember, but the Dolphins were just as entertaining. 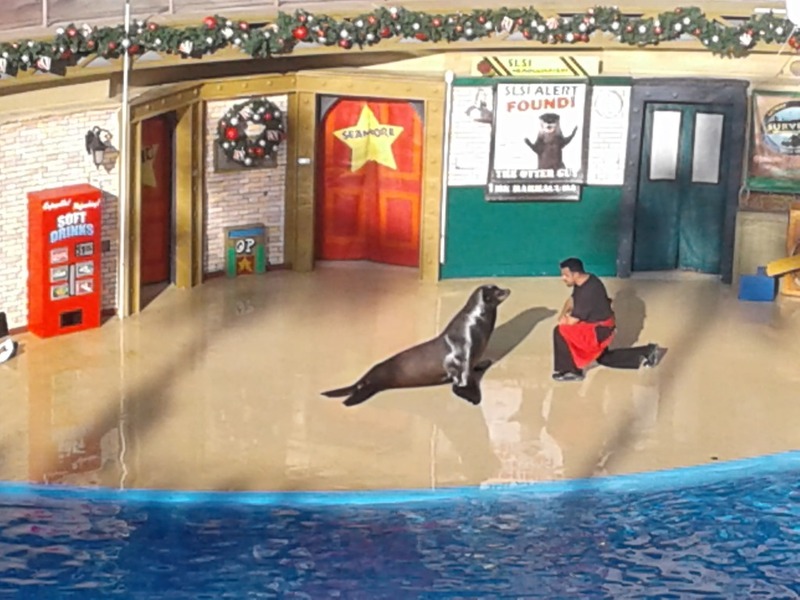 The Sea Lion was probably the most entertaining show in the whole place, just like it was almost 30 years ago. The first time we were here, a Walrus was part of the show, but this time it was a very precocious little Otter. The Penguin enclosure was massive, and the Tuxedo Wearing critters had quite a large audience to entertain. They have added several fast and twisty Roller Coasters to the park, and Jason and I rode the Electric Eel and the Manta. The Eel is very fast and so sharp and twisty that they don’t even allow riders to wear Eyeglasses for fear of them falling off. So, even though I was half-blind I really enjoyed the ride. I even kept my lunch down. They take pictures of all the riders, and we could have bought one of us smiling from Ear to Ear, but the $40 price tag was a bit steep. The following day we drove back to Gold Canyon, spent Christmas Eve visiting with friends in the park. On Christmas Day we prepared a traditional Turkey Dinner and invited Jim and Cheryl to spend the Holiday with us. Jason and Diana prepared a couple of special dishes to treat us with, and we all ended up eating too much. That didn’t stop us from filling up on desserts though. The Kids flew back to Calgary the following day, and we got down to business preparing for hosting a New Year’s Eve party. More on that later.